Reborns — dolls that are made to look as realistic as possible — are an endless source of fascination. We've seen clips of My Fake Baby; the pages of Doll Reader; coverage on morning TV shows; and so on. But which of these oh-so-lifelike dolls are the creepiest? Let's take a look, shall we? This is one of the "breathing" baby dolls from Ashton-Drake. Made of RealTouch™ vinyl skin, these dolls have some kind of mechanism inside that makes it look like the thing is inhaling and exhaling. The copy at the website calls it a "sweet miracle." But it could also be called "give Grandma an aneurysm." This tiny terror costs $129.99. Today, Babble featured lifelike baby dolls inspired by Harry Potter characters, created by artist Tracy Ann Lister. That's Severus Snape on the left and Harry himself on the right. Remus Lupin, also by Tracy Ann Lister. Shudder. Of course, the creepiest one has got to be Voldemort. Yikes. He sold on eBay for about £160.00 — that's $261 in US currency. The Harry Potter creatures aren't the only supernatural little tykes on the market. There are plenty of fairy babies. Baby Bramble, by reborn artist Deborah King, has tiny pointed ears. Some may find them adorable; others may find them unsettling. Just a warning: Not all fairy babies look harmless. 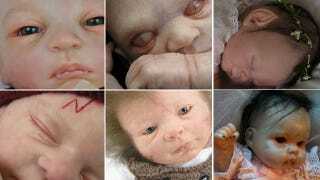 Reborn creator Lacey Michelle features some "dark and twisty" reborn babies, such as a vampire named Edward. He comes complete with a lace jabot, but he's sold. Never to be yours. How much someone paid for him is not known, but since Lacey Michelle's regular babies go for over $500, it's safe to say: A lot. REBORN GOTHIC ART OOAK DEAD VAMPIRE INFANT DOLL! Uh, "dead veining" is really disagreeable, no? Someone has already bid $12, though. Some reborns are not even supposed to be human. The monkey/chimp/orangutan subset of reborn dolls is thriving. Above is Ellie from Judy's Reborn Nursery; Ashton Drake also offers a barrel of monkeys, with prices ranging from $99 - $149. Last, but not least: If the regular reborns aren't terrifying enough for you, get a micro newborn. But whatever you do, be careful with your surreal not-real baby: police recently broke into a car after seeing a reborn locked inside, thinking someone had left an infant in the hot vehicle.